At Cultivate Learning, we create engaging and relevant, evidenced-based resources, training, and professional development for early learning and expanded learning opportunities professionals in all stages of their careers. 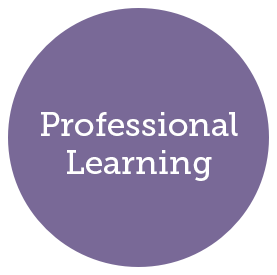 Our goal is to make professional development accessible to all providers through a variety of innovative formats. Circle Time Magazine is a professional development web series and magazine for early childhood educators. With fun and practical strategies, this series highlights real-world examples of providers who are implementing best practices for young children’s success every day. Receive STARS credits by completing the knowledge checks and evaluations at the end of each episode. Meaningful Makeover is a multilingual web series featuring dynamic makeovers of real family child care homes in Washington State. Watch our educational environment experts as they team up with providers to show the secrets and science behind the most impactful early learning spaces. Our institutes and trainings with Early Achievers, coaching, ELO, and the EarlyEdU Alliance are professional development opportunities that bring together experts in the fields of early childhood education and expanded learning opportunities to share research, best practices, and resources. Coaching, an intensely collaborative form of professional development, supports the relationship of coaches and educators in improving child outcomes through the implementation of effective goal setting, practice, reflection, and continuous improvement. The Practice-Based Coaching Framework serves as a foundation for our coaching certificate program, the Coaching Companion (a video feedback and annotation tool), and a range of trainings, consultations, and resources for coaches and providers. ELO is our collaboration with out-of-school programs to provide professional development opportunities for educators who work with children and youth in summer camps, youth centers, sports organizations, after-school programming, and more. EarlyEdU is our commitment to transforming early childhood teacher preparation through partnerships with institutes of higher education, early childhood researchers, workforce development teams across the nation, and philanthropy. Together we are fostering credits that count and degrees that matter. The Partnership for Pre-K Improvement (PPI) is a sustained partnership and study that focuses on improving the quality of state-funded pre-k programs. We co-develop statewide standard evaluation and implementation tools with the aim to improve early learning systems and supports state and nationwide.